Lots of time without weeknotes. Oops. But: lots has been going on. Notably, Lambrigg wrapped up. The final weeks weren’t too crunchy, thankfully: just somesome busy, intense days to get to the finish line. In the final week we designed and wrote a new demo, re-coded both demos so that they could be more easily shared with colleagues, finalised two hardware prototypes, wrote our report and presentation deck, and got the whole thing into a shippable state. Phew. It’s been a really nice shape of project. A research and development piece beginning – about three months ago – with background research, interviews, design reporting, a bit of strategy, and helping colleagues in the management team develop strategy further. Then, we moved into prototyping some preferred approaches in a manner that could be taken further if needed. Across the project, I’ve conducted research interviews, done desk research into design and technology, explored possible technical approaches, designed some game prototypes, built software and firmware in Python, Ruby, Java/Processing, and C++. I’ve designed, fabricated and built up two different custom circuit boards that interface with one another, and built end-to-end prototypes that interface with a computer. I’ve produced CAD models for those boards for Tim to design around. By the end, we had turned all that into coherent physical prototypes with working demos. That feels like a lot. Meaty work. And then, I promptly got ill with endoftermitis: the come-down after pushing perhaps a wee bit hard. So I was off for a bit, and I think that threw my weeknotes muscle. Since then, I’ve been working on a few things. Firstly, decommissioning Holmfell – Erica Scourti’s _Empathy Deck_ – now that the Twitter API no longer supports, well, doing anything fun. We’ve said goodbye, and now we’re working out how best to properly archive a web project. That’s entailed not just taking dumps, but writing documentation for future users on what they are and how to interact with them. For instance, I’ve been turning some of the most significant Postgres tables into CSV – after all, as I say a lot, Excel is the prototyping tool everybody has on their desk, so it’s good to leave things in a state that doesn’t require me. It also turns out the project generated around 17gb of images in its lifespan, so I’ve been trying to archive that in the most space- and time-efficient way possible. Unsurprisingly, it turns out that a little rsync goes a long way. Over on Selworthy, we’ve been thinking a bit about infrastructure and operations, and choosing our next focus for incremental, ongoing improvement. I’ve also been prototyping some new interactions, which are going to be much easier to integrate with the existing front-end after the overhaul the team made to our front-end stack more recently. I’ve started the work around preparing for this year’s Hyper Island Digital Technologies module. This year, it’s more of an incremental overhaul on last year, but it’s been good to start thinking about the structure and narrative of the module up-front. There’ll be more work on that in the weeks to come! I’ve started conversations about a small R&D project called Sharphaw, which ties together some of my experience and expertise to help a company explore taking the objects they make and connecting them to internet services – a bit of IOT prototyping, a bit of thinking about service design, and fabricating a few things. 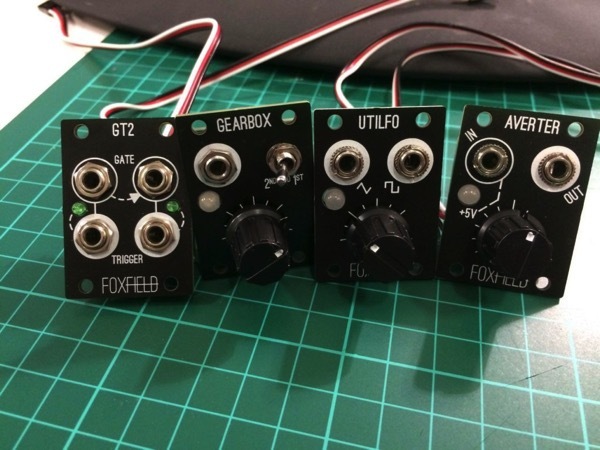 And, over on the music technology side: a small production run of kits for Thonk, and wrapping up an open-source community project I’ve been working on for a good while. I’m hoping to release that in week 306! Phew. That’s a lot. Let’s try to do this more often. Some small news, and then the big news. Over on Selworthy, I continued to work on wrangling ffmpeg and some arithmetic that’s going to to be part of a bit of an overhaul. Looking back on commits, progress feels slower than earlier. That’s because I’m doing a lot of measuring-twice before the cutting-once of a fairly sizeable change to some of the key underlying assumptions of the product. At the end of that work, very little will have changed on the surface – but the little that has will be a key improvement. It goes beyond what I’d call a refactoring given its scope and scale. But that’s my main focus there. On Wapley, I spent a little time with Richard running simultaneous demos on a variety of devices whilst on a Skype chat to confirm and debug some issues. We managed to break the back of a few things that were causing issues and I think that work is all good to go. Empathy Deck got a quick refresh with some new content and graphics work from Erica, and was redeployed into the world. Longcrag has been the codename for Foxfield Instruments, a small imprint I’ve set up to sell electronic musical instruments and kits. Our first four products are a set of “1U tile” utilities for the Eurorack modular synthesizer format, and they’re available to buy right now as DIY kits from Thonk. Even though they’re kits – PCB, panel, components and instructions – there’s been a lot of learning in bringing these into the world: scaling up PCB manufacture; considering packaging and documentation; streamlining the production/kitting process; handling mistakes when they come up. They’ve also been through a number of redesigns as they go from “works for me” to “buildable by anyone“. The first products have, in my head, been finished since January, but there’s been several iterations since to nail the buildability, the panel design, and find an appropriate manufacturer for the PCBs and panels. Now they’re in the world, I think future products will be a bit faster – I have about seven prototypes arriving and hope to show off a few at Brighton Modular – depending on which ones function and which are Any Good At All™. Why imprint? Well: it’s very much a side-project. A project, yes, and a conflux of things I care about – music, tool-making, interaction – but it runs alongisde my client work and projects, and perhaps at a different pace to a company. For now, more like a record label than an electronics startup. I want to give a little back to the synth DIY community I’ve learned so much from, and I want to continue to explore instrumentiness and interaction under this label. At the same time; I’d also like to find things other people enjoy using. I got some feedback from a musician on a new prototype recently, and hearing another player come to their own uses and ideas for what to do with a thing – validating my belief that people might find it useful – was hugely rewarding. Things to make music with is a space I previously explored in Twinklr, and it’s a space I’m going to continue exploring, be it through Foxfield or otherwise. Product in the world, shipping. Onwards. (Well, onwards to week 235, which was a week off). Over on Selworthy my colleague and I licked lots of small tickets into shape, ready for a new deployment shortly. I also broke ground on another challenging binary export format, which is going to be my focus for the next few weeks. I took the Twine protoype we’d made on Gisborough and unrolled it into a stack of HTML pages – easier to make accessible, and customise. Twine had still been useful in prodding the interactivity and seeing how to chunk up the writing, though. We’re gearing up for a second round of testing soon on this. I spent some time on the Empathy Deck, fine-tuning some of the algorithms and prepping a bunch of new content for a spring clean. That should go live shortly. And finally, I had a very busy day on Longcrag. I knocked a bit more of the website into shape, for starters. Then, I spent some time practicing kitting up one of the products: working out how to label the interior bags, how many bags it would need, what should go in each bag to not be confusing, and confirming the documentation was correct for this. I made a set of packing documents for each kit, which would make it much easier to make up these bags. I also bought a set of paper espresso cups to put each bag’s contents into. Lay out 25, fill ’em up all up, tip them all into matching bags, do the next set. Excitingly, the big order from EuroCircuits arrived: all the PCBs and front panels. The front panels were great quality, but two whole sets of them had a serious defect. I mentioned this to the company, and got on with test builds of two of the kits – both of which were very successful. EuroCircuits called me the next day, and we talked over the issue. In the end, it looks like it’s an issue their end, and they’re going to re-make the boards; a huge relief, but also made me feel happier about my decision to go with them. They’re pricier than the Chinese alternative, but the quality of product was great, the turnaround time fast – about 8 days from order to 400 boards (50 each of 8 designs) arriving; the software tools they supply are very reassuring, and the customer service was great. This means that next week I can kit up the two complete kits, and prep for the other two to arrive. Nearly there. And that’s a wrap. Next week: continuing with binary formats, hopefully wrapping up a second pass at some Gisborough content, and continuing to get Longcrag closer to being out the door. Gisborough begins to take shape. Alex, our content designer, has been working with me on picking some topics and then asking me questions to find both the stories we want to tell, and the way we want to tell them. That’s been challenging in all the best ways, and by the end of the week, she’d found an angle and an arc, and we were shaping up for our first prototype and test. Over on Selworthy, I finished up rebuilding our developer tools. I also spent some time working on our internal administration tools: adding some more detailed metrics and notifications for administrative users, and starting to touch on the beginnings of some Slack integration. The first of two deliveries from China for Longcrag arrived – 200 cables with a male end and a female end – and I cut them all in half. The packaging also arrived, and a quick packaging test felt and looked good. Onwards. I spent an afternoon with Erica fettling the Empathy Deck – aka Holmfell – and discussing some new features I’d add in due course. And finally, Wapley had its first test in the wild. It sounded from Richard like it went well; as a result of that, I wrote some quick additions to improve the user experience and make debugging it in the field easier. Nearly a month of weeknotes – gulp – but a month that’s easily summarised. The main focus of this time frame was bringing Holmfell into land and getting it over the finish line. That all went well, and it was feature complete by the beginning of September – at which point I went on vacation for just over a week. I returned to find it still alive and well, with almost minimal fettling required before its official launch. That came with the opening of Bedlam at the Wellcome Collection – and I’ve written more about Empathy Deck, Holmfell as was, over here. I spent some time in week 192 helping Spitalfields Music (on whose Programme Advisory Group I serve) with some interviews for their Open Call brief. And finally, in week 194, I also began a new project with the team at Good Form & Spectacle, which will take me through much of October. Big, complex, and lots to wrap my head around, as ever. More to come there, I’d imagine.